10:15 on a friday night. (Pardon the over use of the term: ‘Before long’ up there, I wasn’t quite paying attention as I typed). The Quiet-riter is perfect for small hands the love smashing keys as hard as possible. Pardon my dishevelled appearance, I’d not seen a comb in 12 hours, bed in 20 and a razor in 2 days. For some reason I was so tired that I’d forgotten to put my glasses on. Oh, and that’s my PJs shirt. 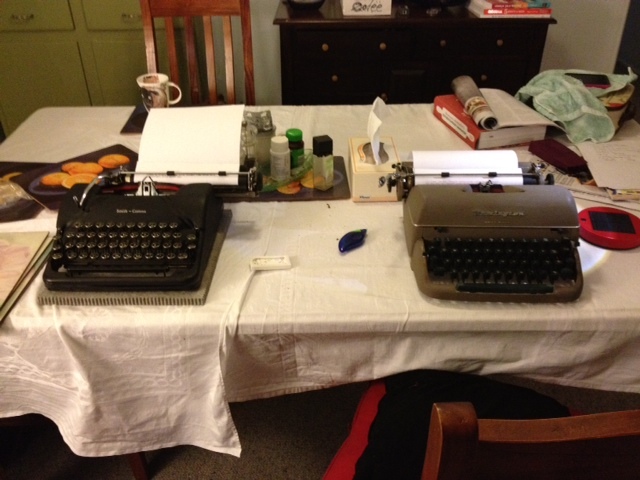 These two sit on the shelf next to my desk – ready to be grabbed and typed with at any time. “Come on kids… I haven’t even had breakfast yet”! $30? Nice and clean… but no thanks. I couldn’t even be bothered bargaining. 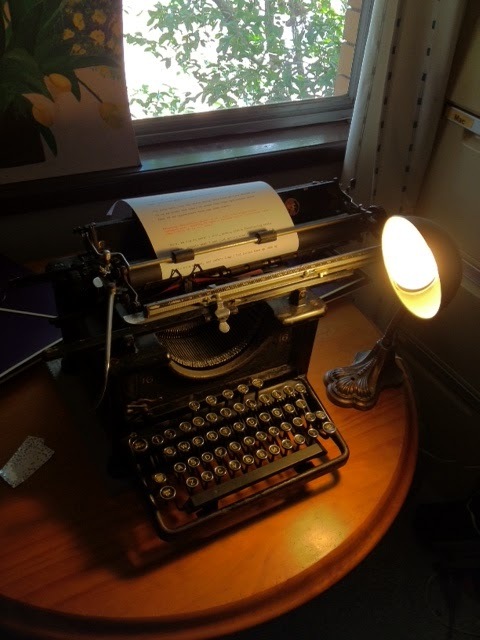 July 8, 2012 in Kids, Lemair Helvetia, letter, market, me., Mr Bean, parents, photos, quiet-riter, Remington, remington 16, sleep over, Sterling, typecast, typewriter, writing. ← To market we will go. That was really very nice. 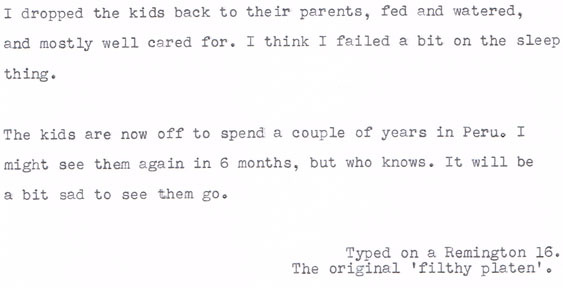 My youngest brother gets so excited when a typewriter gets delivered to their house (I receive my mail there) and instantly has a million questions. It's great. I have been planning on giving him a typer for a while now, but all he really does with them is type curse words and have a good laugh about it. Delightful. 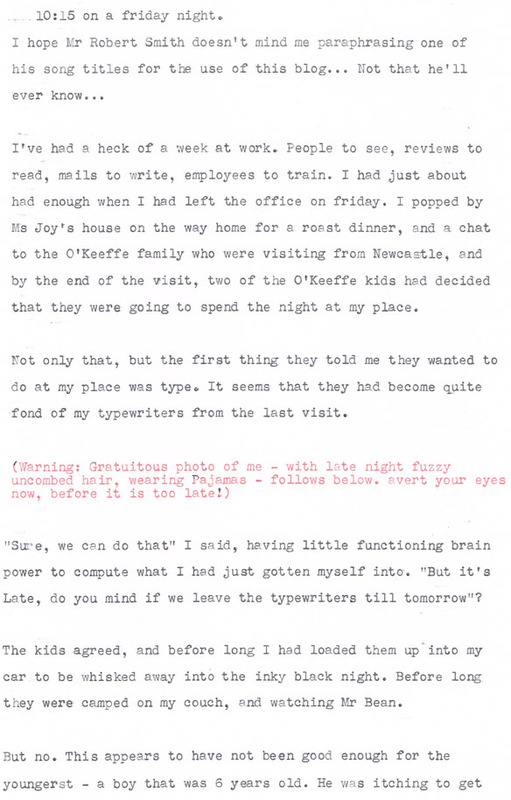 I bet they're going to remember those typewriters for a long time, maybe forever. Thanks for this, just wonderful. 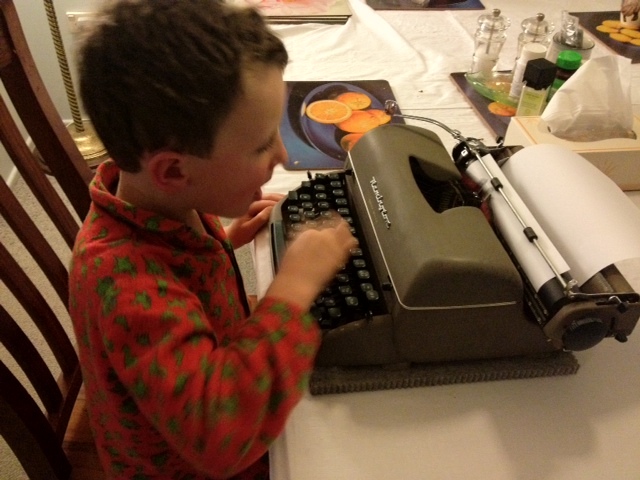 Love the image of your boy in pajamas scrutinizing the typed page. What a sweet post! 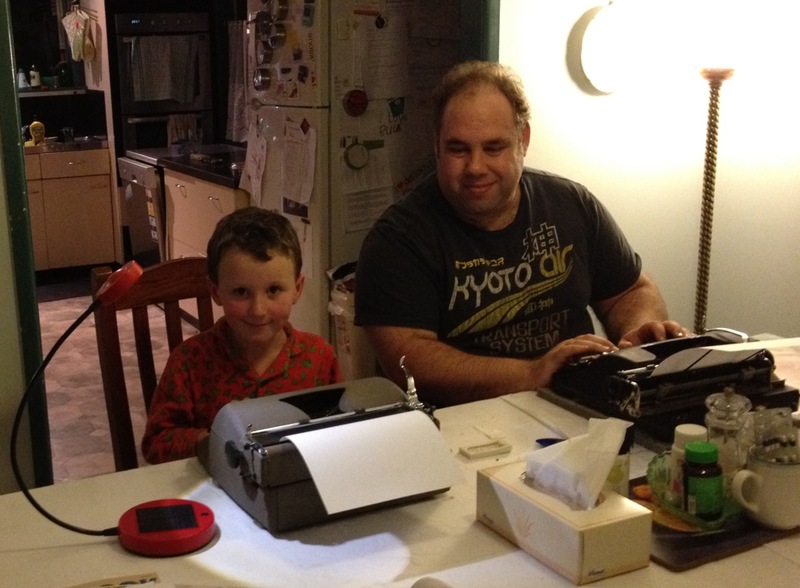 It warms my heart to see kids get so excited about typewriters, as what happened to me at that age. 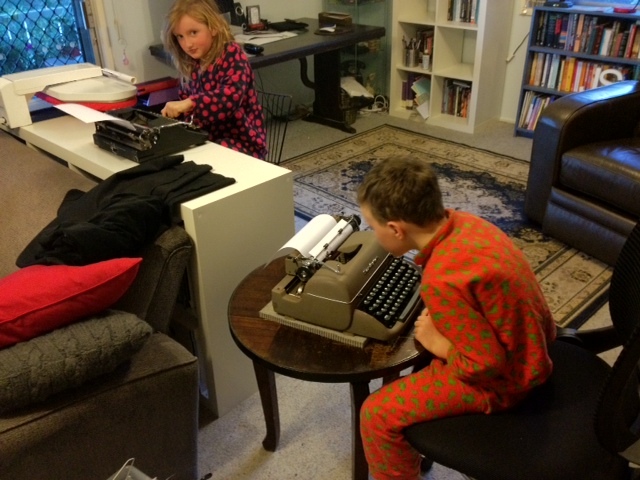 Anything that gets kids away from the television and computer screen is wonderful, especially when it happens to be typewriters! 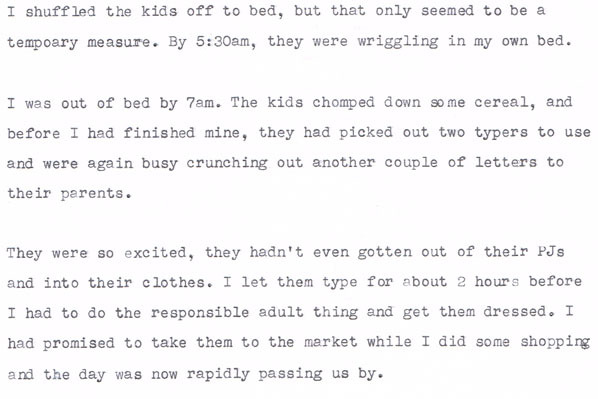 A night those children will be remembering. You have some very nice typewriters. 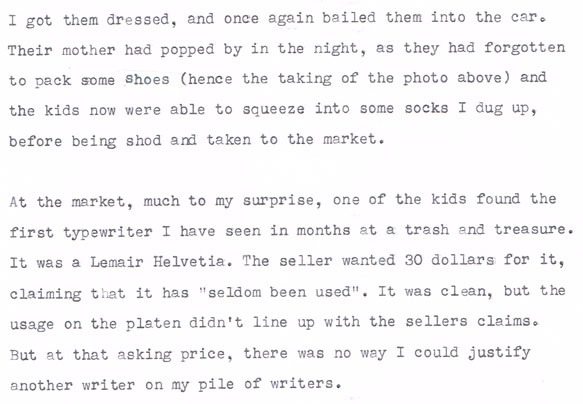 I'd have tested the Lemair and then tried to get the seller down to $20 anyway. 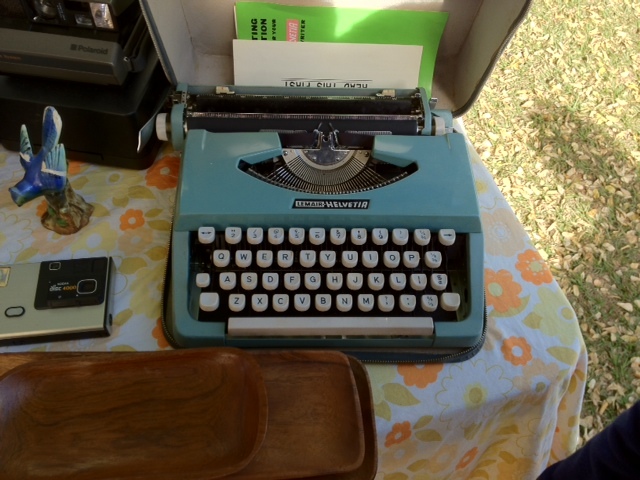 Although I seldom paid more than $5.00 for most local typewriters when found. Very heartwarming to have fun like this with kiddies. Ha ha ha ha…. Oh, I wouldn't hold that against him. What is the first thing we all do when we learn a new language? We want to know how to swear. But we get past that. Get him one for sure! You never know where it will lead. Oh for sure. It's going to be one of those things that they remember from their childhood. Nice to have been the person to introduce them. His progress along the page was a bit slow, and after I taught him how to use correction tabs, he really started to go for quality over quantity. They were having a ball, and I was more than encouraging of it. These guys are pretty active kids, and they're totally awesome to spend time with. They've promised to write from Peru, so it should be great to see a response! But they aren't ones for sitting in front of the TV all day. And even though they have an X-Box, I don't recall ever seeing it being used. I've worked in markets before, and I knew I could haggle him down on price. He was making all the 'disinterested' faces when I talked to him, just waiting for the challenge. But at $30, well… it was $30 better spent elsewhere. I reckon I could have easily got him to $20. $15 at a stretch. But honestly, I'm focused on quality over quantity now, and although I'm sure the Lemair is a good typer, and would make an excellent project piece, it doesn't match what I'm aiming for. And it is WAY out of my preferred era. (1930's and 40's).